The S&P 500 is up more than 6 percent since Oct. 29, when it closed down more than 10 percent from its all-time high reached in late September. But commodities like oil, gasoline, copper and platinum are still in a correction or in a bear market — down at least 20 percent from their 52-week highs. Commodities are typically seen as leading indicators for global growth as they are used for everything from homebuilding to powering cities. A decline in commodity prices can signal slower economic growth moving forward. Commodities have been hit by a slew of factors, including higher rates, a stronger dollar, weakness in overseas markets and increasing friction in global trade relations. 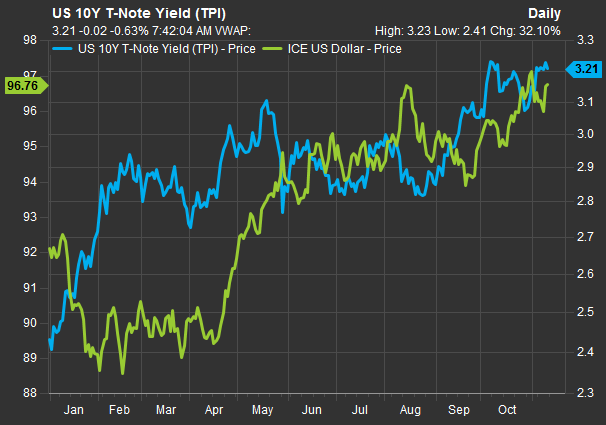 The yield on the benchmark 10-year Treasury note is trading around 3.23 percent, near its highest levels since 2011. The 2-year yield, meanwhile, is trading at a level not seen in more than a decade. Yields have risen this year as risen this year as the Federal Reserve continues to unwind historically accommodative monetary policy. The Fed has increased the overnight rate three times this year and is expected to hike once more before year-end. Higher rates hurt commodities because they make it more expensive to store them for a prolonged period. Meanwhile, the stronger dollar has also hit commodities which are priced in the U.S. currency. The greenback is up more than 5 percent against a basket of currencies. The U.S. economy grew at a 3.5 percent annualized pace in the third quarter, topping expectations. In China — the world’s second-largest economy — economic growth slowed to 6.5 percent in the third quarter, missing estimates. Meanwhile, euro zone GDP growth decelerated to 0.2 percent in the third quarter from 0.4 percent in the second quarter. On top of that, continuous trade tensions between the U.S. and China have also depressed commodity prices. Washington and Beijing have exchanged tariffs on billions of dollars worth of each other’s goods this year, sparking fears that tighter trading conditions could slow down global growth. “What’s happening in the commodity markets has to do with trade,” said Tim Courtney, chief investment officer at Exencial Wealth Advisors. He added, however, that he does not think the commodity complex’s broad decline is signaling an economic contraction ahead. The decline in commodities has been especially hard on emerging markets as most are net commodity exporters. The iShares MSCI Emerging Markets ETF (EEM) — which tracks a broad basket of emerging market stocks — is down nearly 14 percent for 2018 through Thursday’s close. The iShares ETFs that track Mexican and Chinese stocks are also down 13.6 percent and 11.2 percent, respectively. But Matt Lloyd, chief investment strategist at Advisors Asset Management, said the sharp losses in commodities could be a buying opportunity for investors as we get closer to the end of the current economic cycle.